Fourth graders are eager to learn all about their world and their place in it. Abeka's engaging curriculum, built on a solid Christian worldview, will keep them captivated as they learn fascinating facts and improve reading comprehension, composition skills, and much more! 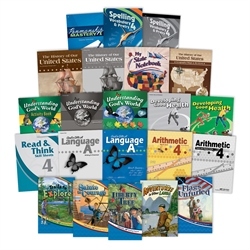 The Grade 4 Child Kit contains all essential textbooks and coordinated materials, including assessments, for an entire year of schooling in language arts, arithmetic, science, health, and history—22 items total. Combine this kit with the Grade 4 Parent Kit, and you can confidently teach and guide your fourth grader through a year of academic excellence. Reading—Reading from classics, modern stories, and poetry gives your child insight into his world and presents him with Christian ideals and spiritual values. Watch his reading comprehension and vocabulary take a leap with the added emphasis on reading speed and comprehension skills. Grammar and Composition—You will be thrilled to see your fourth grader become more comfortable with correct grammar in conversation and composition. Spelling, Vocabulary, and Poetry—A straightforward teach/practice/test approach makes spelling “second nature” to your young writer. He will also learn to spell, define, and use 5–10 vocabulary words in each lesson. And what an accomplishment when he can recite from memory all 6 poems! Penmanship—Daily penmanship practice begins with a review of letter formation and then graduates into creative writing and spelling entries. Arithmetic—Learning fractions becomes a positive experience because of clear instruction and extensive practice. As in the other skills subjects, the Abeka program ensures repetition and maintenance of basic skills and builds a foundation of understanding that is necessary for more abstract concepts taught later. Science/Health—Fourth graders love the emphasis on nature studies and God’s creative genius in science. In the 7-week Health course, they learn how to keep their bodies healthy. History—Hundreds of colorful visuals and a lively narrative writing style may make the story of America’s history your child’s favorite class! Told from a Christian perspective and combined with enjoyable geography and map activities.